This is a review of the Longevity MIGWeld 140 and why I choose it over the Millermatic 140 Auto-Set and the Lincoln Power MIG 140. Obviously cost is a big issue for everyone. I am not using this machine as a production welder and I don’t want to own a shop. So spending too much on a welder is not a wise decision for me. The Longevity MIGWeld 140 cost a lot less then the Millermatic 140 Auto-Set and the Lincoln Power MIG 140. Longevity makes an excellent machine for less than half of the cost and still cares about their customers. It would cost you more to take a MIG welding class then to buy this welder. My old at home welder was a Miller Syncrowave 250 that I bought new in 1996. It does not MIG weld but since this is a home machine I needed to move it back and forth out of my storage shed to my work space. After moving a almost 400 lbs welder too many times I am sick and tired of heavy equipment. Weight has become a big issue. The MIGWeld 140 weighs less than half of what the competitors welders weigh. My initial concern about Longevity was that they build them in China. Chinese equipment like Harbor Freight is disposable garbage that just does not last. Longevity builds their equipment in China but engineers it themselves. This is the same thing Apple computers does and many other high tech American companies do. The quality of their welders is excellent! Finally the warranty tells you a lot about the welder. Longevity welders have a standard 5 year warranty verses Lincoln and Millers 3 year warranty. It is a safer bet to get a welder with a better warranty simple because you are covered if it breaks. If I can beat the hell out of a few hundred dollar MIG welder for five years then I have gotten way more than my money’s worth! A MIG Gun with all needed accessories. The only thing the Longevity comes with the others don’t is a welding shield, wire brush and chipping hammer. Those are absolute garbage! If you buy this machine you might as well throw those out because that is the typical Chinese made crap I expected. Now I did get a Longevity auto darkening welding helmet and that is a nice helmet but that is another story. The MIG gun, cables and all of the accessories feel solid and of the same quality you get from Miller or Lincolns competing models. The liner, MIG tips, cone and even the regulator work just the way you would expect them to. There are no issues with the feel and quality of the equipment. Again this is not the disposable Chinese Harbor Freight quality! How Good Does The Longevity MIGWeld 140 Actually Weld? Here is the BIG answer everybody wants to know! To start I have to say I expected a lot less and I was way wrong! The MIGWeld 140 produces excellent welds. I beat the crap out of this welder trying to pop the duty cycle fuse running at 140 amps on a welding table project. No matter how hard I pushed this welder I could not get it to pop its beaker. Your gloves will start smoking from the heat of the weld before tha overload circuit kicks in! The welds had excellent penetration and I tested both solid MIG wire and Self Shielding Flux Cored Arc Welding Wire. Most of the time when I MIG weld the machines are typically a Millermatic 252, Millermatic 350P, Miller suitcase with a XMT power source or a Miller Deltaweld (High power machine for heavy plate). For such a small welder it did really well. So here are the welds. Before beginning I want to say that I have not welded for a long time so I am way out of touch. My welds are not what they normally are when I weld every day. To start during this test I was also building a welding table for my home and I pushed this welder a lot further then it was designed to weld. Longevity’s manual says when welding with a .025 MIG wire you should not exceed a metal thickness of 12 gauge but I had no problems welding 3/16 flat bars to 1/8"plate and later 1/8" thick angle to ¼" plate with excellent penetration (I accidentally erased the 1/4 plate picture). Finally I welded a 1/16″ thick flatbar. Below are the welds I did. The two pictures below are MIG welds done MIGWeld 140. The first picture is a fillet weld test done on 3/16″ thick flat bars. The machine is not designed for MIG welding this thick material but it did great. The second picture is a 1/8″ thick angle welded to a 1/8″ plate. Both welds came out good. The first picture on the right is a close-up of the weld penetration done on a 1/16″ thick flat bar. As you can see the machine has more power than Longevity says it does. The second picture is the back of a 1/8″ plate that was welded with the MIGWeld 140 and as you can see the mill scale blistered. That is a good sign of penetration. The Self Shielding Flux Cored Wire welded thicker metals with no problem. You can weld 1″ plate if you want to and get good penetration as long as it is done with multi pass fillet welds. The pictures below are done on 7/16 inch thick plate with the 030 E71T-11 self shielding Flux Cored Wire also know as Gasless MIG welding. The first weld was done it the flat position, the second is a vertical up fillet root weld and the last is a weave weld. They all did great and penetrated with no problems. 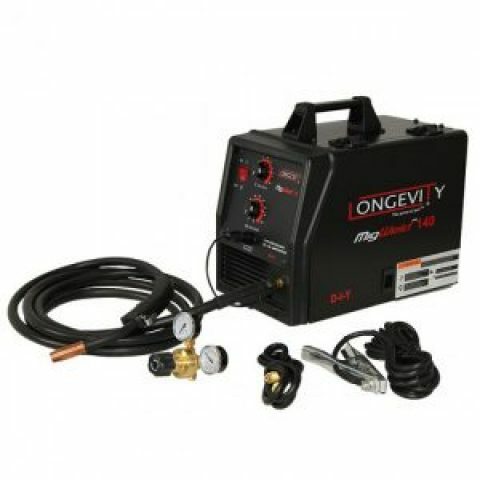 The Final Word On The Longevity MIGWeld 140 MIG Welder. 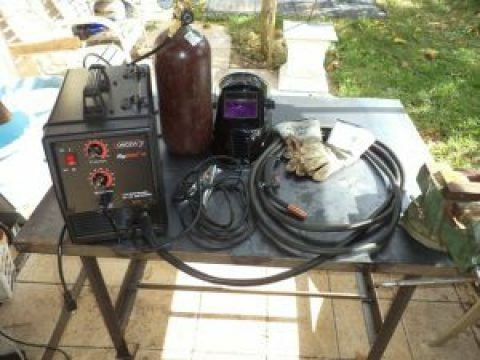 When it comes to this welder Longevity describes its equipment perfectly. “The LONGEVITY MIGWELD 140 delivers industrial quality and performance at an affordable price"
This little machine is priced right at half the cost of competitor models, weighs less the Millers and Lincoln’s models, has a superior warranty and performers better than Longevity states in their manual. Overall I would recommend this welder to anyone from the at home welder to a body shop all the way to sheet metal welding/fabrication business. The machine delivers more than it was designed to do and does it an affordable price. What more can you ask for?